In colloquial language, an average is a single number taken as representative of a list of numbers. Different concepts of average are used in different contexts. Often "average" refers to the arithmetic mean, the sum of the numbers divided by how many numbers are being averaged. In statistics, mean, median, and mode are all known as measures of central tendency, and in colloquial usage any of these might be called an average value. 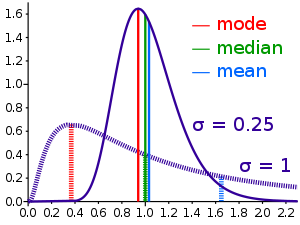 The mode, the median, and the mid-range are often used in addition to the mean as estimates of central tendency in descriptive statistics. These can all be seen as minimizing variation by some measure; see Central tendency § Solutions to variational problems. The mid-range is the arithmetic mean of the highest and lowest values of a set. Interquartile mean A special case of the truncated mean, using the interquartile range. A special case of the inter-quantile truncated mean, which operates on quantiles (often deciles or percentiles) that are equidistant but on opposite sides of the median. However, this method for generating means is not general enough to capture all averages. A more general method for defining an average takes any function g(x1, x2, ..., xn) of a list of arguments that is continuous, strictly increasing in each argument, and symmetric (invariant under permutation of the arguments). The average y is then the value that, when replacing each member of the list, results in the same function value: g(y, y, ..., y) = g(x1, x2, ..., xn). This most general definition still captures the important property of all averages that the average of a list of identical elements is that element itself. The function g(x1, x2, ..., xn) = x1+x2+ ··· + xn provides the arithmetic mean. The function g(x1, x2, ..., xn) = x1x2···xn (where the list elements are positive numbers) provides the geometric mean. The function g(x1, x2, ..., xn) = −(x1−1+x2−1+ ··· + xn−1) (where the list elements are positive numbers) provides the harmonic mean. This method can be generalized to examples in which the periods are not equal. For example, consider a period of a half of a year for which the return is −23% and a period of two and a half years for which the return is +13%. The average percentage return for the combined period is the single year return, R, that is the solution of the following equation: (1 − 0.23)0.5 × (1 + 0.13)2.5 = (1 + R)0.5+2.5, giving an average return R of 0.0600 or 6.00%. Given a time series such as daily stock market prices or yearly temperatures people often want to create a smoother series. This helps to show underlying trends or perhaps periodic behavior. An easy way to do this is the moving average: one chooses a number n and creates a new series by taking the arithmetic mean of the first n values, then moving forward one place by dropping the oldest value and introducing a new value at the other end of the list, and so on. This is the simplest form of moving average. More complicated forms involve using a weighted average. The weighting can be used to enhance or suppress various periodic behavior and there is very extensive analysis of what weightings to use in the literature on filtering. In digital signal processing the term "moving average" is used even when the sum of the weights is not 1.0 (so the output series is a scaled version of the averages). The reason for this is that the analyst is usually interested only in the trend or the periodic behavior. The root is found in Arabic as عوار awar, a defect, or anything defective or damaged, including partially spoiled merchandise; and عواري ʿawārī (also عوارة ʿawāra) = "of or relating to ʿawār, a state of partial damage". Within the Western languages the word's history begins in medieval sea-commerce on the Mediterranean. 12th and 13th century Genoa Latin avaria meant "damage, loss and non-normal expenses arising in connection with a merchant sea voyage"; and the same meaning for avaria is in Marseille in 1210, Barcelona in 1258 and Florence in the late 13th. 15th-century French avarie had the same meaning, and it begot English "averay" (1491) and English "average" (1502) with the same meaning. Today, Italian avaria, Catalan avaria and French avarie still have the primary meaning of "damage". The huge transformation of the meaning in English began with the practice in later medieval and early modern Western merchant-marine law contracts under which if the ship met a bad storm and some of the goods had to be thrown overboard to make the ship lighter and safer, then all merchants whose goods were on the ship were to suffer proportionately (and not whoever's goods were thrown overboard); and more generally there was to be proportionate distribution of any avaria. From there the word was adopted by British insurers, creditors, and merchants for talking about their losses as being spread across their whole portfolio of assets and having a mean proportion. Today's meaning developed out of that, and started in the mid-18th century, and started in English. .
^ a b Bibby, John (1974). "Axiomatisations of the average and a further generalisation of monotonic sequences". Glasgow Mathematical Journal. 15: 63–65. doi:10.1017/s0017089500002135. ^ Box, George E.P. ; Jenkins, Gwilym M. (1976). Time Series Analysis: Forecasting and Control (revised ed.). Holden-Day. ISBN 0816211043. ^ Haykin, Simon (1986). Adaptive Filter Theory. Prentice-Hall. ISBN 0130040525. ^ a b "Studies in the History of Probability and Statistics: VII. The Principle of the Arithmetic Mean". Biometrika. 45: 130. doi:10.2307/2333051. ^ a b Eisenhart, Churchill. "The development of the concept of the best mean of a set of measurements from antiquity to the present day." Unpublished presidential address, American Statistical Association, 131st Annual Meeting, Fort Collins, Colorado. 1971. ^ a b Bakker, Arthur. "The early history of average values and implications for education." Journal of Statistics Education 11.1 (2003): 17-26. ^ "Waterfield, Robin. "The theology of arithmetic." On the Mystical, mathematical and Cosmological Symbolism of the First Ten Number (1988). page 70" (PDF). Archived from the original (PDF) on 2016-03-04. Retrieved 2018-11-27. ^ Medieval Arabic had عور ʿawr meaning "blind in one eye" and عوار ʿawār meant "any defect, or anything defective or damaged". Some medieval Arabic dictionaries are at Baheth.info, and some translation to English of what's in the medieval Arabic dictionaries is in Lane's Arabic-English Lexicon, pages 2193 and 2195. The medieval dictionaries do not list the word-form عوارية ʿawārīa. ʿAwārīa can be naturally formed in Arabic grammar to refer to things that have ʿawār, but in practice in medieval Arabic texts ʿawārīa is a rarity or non-existent, while the forms عواري ʿawārī and عوارة ʿawāra are frequently used when referring to things that have ʿawār or damage – this can be seen in the searchable collection of medieval texts at AlWaraq.net (book links are clickable on righthand side). ^ a b The Arabic origin of avaria was first reported by Reinhart Dozy in the 19th century. Dozy's original summary is in his 1869 book Glossaire. Summary information about the word's early records in Italian-Latin, Italian, Catalan, and French is at avarie @ CNRTL.fr. The seaport of Genoa is the location of the earliest-known record in European languages, year 1157. A set of medieval Latin records of avaria at Genoa is in the downloadable lexicon Vocabolario Ligure, by Sergio Aprosio, year 2001, avaria in Volume 1 pages 115-116. Many more records in medieval Latin at Genoa are at StoriaPatriaGenova.it, usually in the plurals avariis and avarias. At the port of Marseille in the 1st half of the 13th century notarized commercial contracts have dozens of instances of Latin avariis (ablative plural of avaria), as published in Blancard year 1884. Some information about the English word over the centuries is at NED (year 1888). See also the definition of English "average" in English dictionaries published in the early 18th century, i.e., in the time period just before the big transformation of the meaning: Kersey-Phillips' dictionary (1706), Blount's dictionary (1707 edition), Hatton's dictionary (1712), Bailey's dictionary (1726), Martin's dictionary (1749). Some complexities surrounding the English word's history are discussed in Hensleigh Wedgwood year 1882 page 11 and Walter Skeat year 1888 page 781. Today there is consensus that: (#1) today's English "average" descends from medieval Italian avaria, Catalan avaria, and (#2) among the Latins the word avaria started in the 12th century and it started as a term of Mediterranean sea-commerce, and (#3) there is no root for avaria to be found in Latin, and (#4) a substantial number of Arabic words entered Italian, Catalan and Provençal in the 12th and 13th centuries starting as terms of Mediterranean sea-commerce, and (#5) the Arabic ʿawār | ʿawārī is phonetically a good match for avaria, as conversion of w to v was regular in Latin and Italian, and -ia is a suffix in Italian, and the Western word's earliest records are in Italian-speaking locales (writing in Latin). And most commentators agree that (#6) the Arabic ʿawār | ʿawārī = "damage | relating to damage" is semantically a good match for avaria = "damage or damage expenses". A minority of commentators have been dubious about this on the grounds that the early records of Italian-Latin avaria have, in some cases, a meaning of "an expense" in a more general sense – see TLIO (in Italian). The majority view is that the meaning of "an expense" was an expansion from "damage and damage expense", and the chronological order of the meanings in the records supports this view, and the broad meaning "an expense" was never the most commonly used meaning. On the basis of the above points, the inferential step is made that the Latinate word came or probably came from the Arabic word. ^ Ray, John (1674). A Collection of English Words Not Generally Used. London: H. Bruges. Retrieved 18 May 2015.